EXECUTIVE SUMMARY: With the start of a new era in the White House, Israel must let go of the two-state solution as defined by the Clinton Parameters. It is time for a reassessment of Rabin’s approach, which stressed the importance of the preservation and development of Area C in Judea and Samaria under Israeli control as a prerequisite for defensible borders. The entry of President Trump into the White House marks a new era in the US and around the world, giving rise to crises and upheavals as well as new opportunities. The demands of the State of Israel, in the context of its overall vital interests in the region, will be reviewed and reassessed. It is imperative that Israel formulate a clear stand on central issues based on wide public support. As a first step, Israel must let go of the two-state solution as laid out in the Clinton Parameters. The time has come to inquire what Prime Minister Netanyahu means when he speaks of his commitment to a two-state solution. When even the leaders of the Zionist Left agree that settlement blocs should remain under Israeli sovereignty, it must be clarified for the public what these blocs actually mean. Do they contribute anything towards Israel’s need for defensible borders? The course Israel has taken since the signing of the Oslo Accords requires critical examination, regardless of the essential reassessment in anticipation of the Trump era. Since the autumn of 1993, almost everything has changed. Above all, new threats have emerged with a previously unknown military logic of their own. The Israeli-Palestinian issue, too, has undergone significant changes. The ​Oslo idea, in its quest to end Israeli control over Palestinian citizens, was largely realized. It was already complete in January 1996, when Israel concluded the withdrawal of its forces from the populated territories of the West Bank. The Palestinian population living in Areas A and B, or approximately 90% of the total Palestinian population of the West Bank, has been controlled since then by the Palestinian Authority (PA). How can this be described as “apartheid”? In the summer of 2005, the Israeli presence in the Gaza Strip ended (control over the Palestinian population in the Strip had already been transferred to the PA in May 1994). Gaza has been a sovereign entity controlled by Hamas since its seizure of power in the summer of 2007. East Jerusalem and Area C in the West Bank remain in dispute, including settlements, army bases, major roads, vital commanding areas, and the open expanse towards the Jordan Valley. These areas, held by Israel, are the minimum required for the conservation of a defensible territory. They fill two necessary conditions for a secure Israel. The first is the buffer area of the Jordan Valley, without which it would be impossible to prevent the quick arming of Palestinian terrorists in Judea and Samaria. The second is the advantage of Israeli control over the main longitudinal and lateral routes, which, together with the hold over the commanding areas, enables speedy access of IDF operational forces deep into Palestinian concentrations. Relinquishing these prerequisites in the Gaza Strip enabled the emergence of the Hamas military threat. UN Security Council Resolution 2334 and the Paris Conference further solidified the notion of ​​two states as requiring a complete overlap of two not-necessarily congruent trends: the ending of Israeli control over the Palestinians, and the establishment of a Palestinian state based on the 1967 borders and a full Israeli withdrawal. Prime Minister Yitzhak Rabin was disinclined towards this overlap, as expressed in his last speech in the Knesset (October 1995). He was resolute on Jerusalem and emphasized the crucial hold by Israel of the Jordan Valley and the lateral routes leading to it. The Clinton Parameters for conflict resolution, laid out in December 2000, were a step back from Rabin’s position. The turnaround was summed up in two premises not held by Rabin. The first was that the solution required the establishment of a continuous, fully sovereign Palestinian state, whereas Rabin envisaged a political entity short of a fully-fledged state. 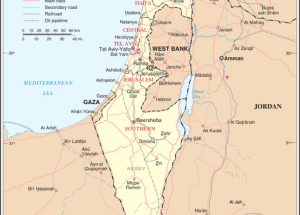 The second was that the border between Israel and Palestine should be based, with minor changes, on the 1967 borders in Judea and Samaria and the Gaza Strip. These premises left very little room for negotiation. Some clarification is required on how the Israeli position pulled away from the Rabin solution and towards the Clinton solution, which, in all likelihood, Rabin would not have accepted. It is noteworthy that Rabin exploited the implementation of the Oslo accords to reshape the area as delineated by Israeli security interests. As part of this effort, he led a drive to construct a network of bypassing roads in Area C, without which the IDF would have had great difficulty advancing its forces to the deployment areas during Operation Defensive Shield (2002). The IDF could not, for example, have transferred a tank division hauled on tank transporters from the Anatot Base to Nablus if its route had passed through Police Square in Ramallah. The fast, advanced road network outlined by Rabin gave Israel control over routes and flexibility in operating IDF forces, and demonstrated during Operation Defensive Shield the operational significance of utilizing to the full an area that is defensible. Rabin’s expanse-shaping moves were conducted concurrently with progress on the implementation of the Oslo Accords, and the international community made no claims that he was misleading it. By contrast, any advance, however small, made in building up Jerusalem raises the suspicion that Netanyahu may not be sincere in his intentions about two states. There are many reasons for this difference, one of the most important being that Rabin did not commit to a continuous Palestinian state in the form of the Clinton Parameters. Netanyahu, especially during his term after 2009, found himself tied to that frame of reference. At the strategic crossroads where we now stand, the Israeli government must re-clarify the complex of security interests inherent in Israel’s control over Area C. In this reexamination, Israel must depart from the idea of ​​two states as interpreted, for example, by Maj. Gen. (res.) Yaakov Amidror, former head of the National Security Council. He has argued and continues to argue that while current circumstances do not allow the reaching of a permanent agreement, and it is dangerous to rush towards unilateral withdrawal, the idea of ​​dividing the area into two states on the basis of the 1967 borders, with amendments made for “settlement blocs,” is nevertheless the only reasonable option by international standards. Therefore, according to his understanding, settlement activity in all remaining areas that might someday be included in a Palestinian state should be avoided. Statements along these lines and in this spirit have also been made by Dennis Ross. Herein lies the main disagreement on what to do in Area C.
An Israeli reassessment has the potential to introduce a change in Jerusalem’s position by renewing its demand for the preservation of a defensible area, which depends on consistent Israeli hold over Area C.
The Israeli and international dominant discourse puts the State of Israel at an imaginary crossroads with only two options: preserving the democratic Jewish state by retreating to the 1967 areas, or becoming trapped in a conflicted binational state in which apartheid is inevitable. This is a conceptual trap not devoid of manipulation, as a crossroads allows more than two directions. The Israeli discourse, caught between these two dichotomous choices, ignores the potential security threat stemming from loss of control over the depth of the area and the Jordan Valley. Senior security officials who support withdrawal assure the public that the army would be able to meet the country’s security challenges even with withdrawal to the 1967 lines. Their position ignores important changes that have taken place. If, after the withdrawal, the West Bank is taken over by an organization similar to Hamas in Gaza – Hezbollah, in all likelihood – the IDF would struggle to provide an adequate response to the possibility of simultaneous attack on Israel on several fronts. These officials claim that even after uprooting the Jewish residents, the IDF would be able to operate throughout the area. But they ignore the level of forces that would be required for this undertaking. Without the mass presence of a Jewish population, the IDF will be defeated, and will withdraw as it did from south Lebanon in May 2000. In the new war, under the new logic, citizens have a significant role to play in the general fighting effort. This was visible in the fighting in Donetsk, Crimea, and Abkhazia, as well as in the Chinese expansion into the China Sea via thousands of civilian fishing boats. It is a familiar necessity resonating from the early days of Zionism: to maximize the civilian presence together with a military foothold. In short, without a constant hold on the whole of Area C, Israel has no defensible borders. The way Rabin delineated the expanse of Area C demonstrates his farsighted understanding of the importance of those areas beyond the 1967 borders, which must be in Israel’s full control. It is time to emphasize that there is more than one way to realize the two-state logic. It is in Israel’s security interests that it embark on full-scale construction in Area C.
This is an edited version of an article that appeared in Makor Rishon on January 20, 2017.